One of the things Giulietta is committed to is that everything on her menu has a specific meaning. So it’s a scarce menu but resonant with her story; coconuts (served with a straw and spoon to scoop out the flesh) because of the years she had spent relying on them for easy sustenance, and because they truly did help her strike up conversations with strangers, and toast because it represents comfort. Coffee, she says, represents speed and communication, and her go-for-broke option called “Build Your Own Damn House,” consists of a coffee, a coconut, and a piece of cinnamon toast. Yesterday, I managed to squeeze in a coffee&cake&catch-up with my good friend Becky – a very rare treat in the busy schedule of family life on a weekend! – and we were talking about the cafe and how to overcome the challenge of it being a place for everyone to feel welcome, safe and connected. We started talking about lunch options and the need for them to be healthy and relatively cheap. She suggested having a daily humous special on the menu – healthy, easy to make, good with toast, and ‘cheap as chips’. I like it! But I couldn’t work out how it fitted into the way Giulietta approached her menu choices. It had obviously been playing on my mind in my sleep because I woke up this morning with a desperation to make a batch of humous. I soaked the chickpeas, boiled them up this afternoon, and tonight whizzed them together with the olive oil, garlic, lemon, tahina, pinch of salt…. and then I remembered a tip I read in Ottolenghi’s fabulous recipe book, ‘Jerusalem’: add some ice cold water until it is the right consistency. Dash more lemon juice, quick taste… mmmm…. delicious. 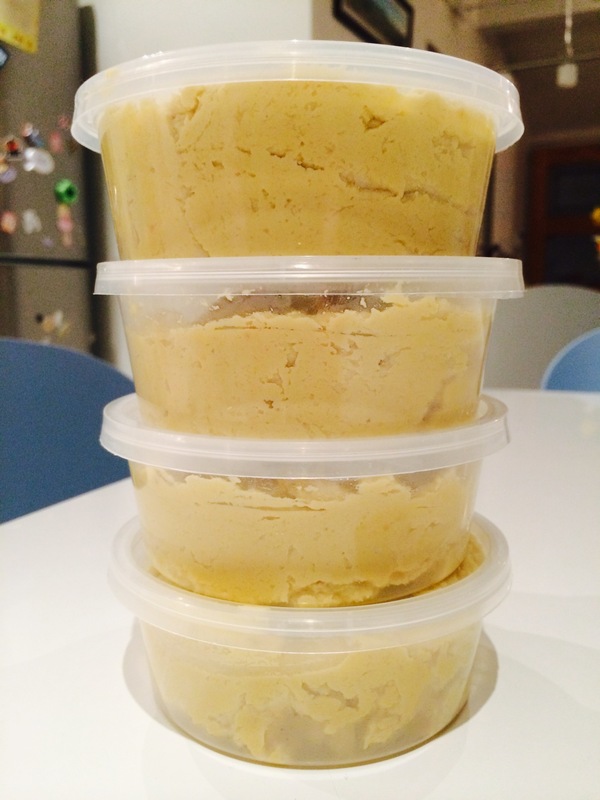 Four pots of humous potted up. Three for the freezer, one for the fridge, I’m a happy lady. But it still doesn’t quite add up as to why it’s going to go on the menu. just wantdd toߋ say ggreat bloɡ! Thanks for the vote of confidence from Israel!